How useful is a malehealth mini manual? Neil John reports on Surviving Cancer. 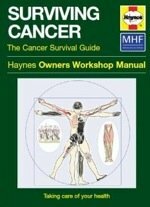 As a technician, I was at a conference and saw the mini manual on Surviving Cancer. I was scanning through. I explained I had survived cancer and was interested in reading it. I was told I could take a copy. On reading it, it is something I wished I had when I was first diagnosed. It was explained in a clear and concise way which I could understand without any medical terms. The simple advice it gives is something I had to find out for myself. It gave advice and support groups which I thought was good, especially on internet use. Researching cancer on the internet is scary. I was lucky in the way I had a friend who is a doctor and forwarded me websites to look at. Thanks for a great book and the only wish I had was I had this a couple of years ago. The medical care was first class from my GP through to consultant. I could ask anything to do with the medical aspects but felt I could not ask anything else - the personal and social things - as I felt uneasy to ask and also did not want to waste the doctors time. My thoughts and feelings were something I had to go through on my own with support of family and friends. At times it was difficult but I am quite sensible and while I did go through an emotional rollercoaster I came out the other side. The book was helpful even this far on as it explained what I felt and went through was normal. Thanks for a great booklet.